Dr. Launcher suggests a ‘meat free day’ each week as a detox to reset your digestive system. Further to this, recent research at Harvard University found that just one meat-free day a week can reduce your risk of heart disease by up to 19% and cutting your weekly intake by the equivalent of a 450-calorie steak will limit weight gain by nearly half a stone over your next 10 years of flesh-eating. Start by preheating the oven to 190 celsius. Put the coconut into the oven for 3-4 minutes until lightly toasted, combine with the roasted hazelnuts. Set aside. Peel the sweet potato and cut into 2 cm-3cm cubes. Toss the sweet potato in a bowl with 20g coconut oil, salt/pepper to evenly coat and put into the oven to roast for 15 minutes or until nicely brown. Combine red and black quinoa into a pot with water and 1 tsp. sea salt. Cook red and black quinoa as if cooking pasta. Bring to a boil, reduce heat and cook for 12-15 minutes. While the quinoa and sweet potato are cooking, remove the stalks from the kale and cut into 2cm chiffonade. Remove avocado flesh and cut into cubes. Massage kale with coconut oil until kale leaves have softened. 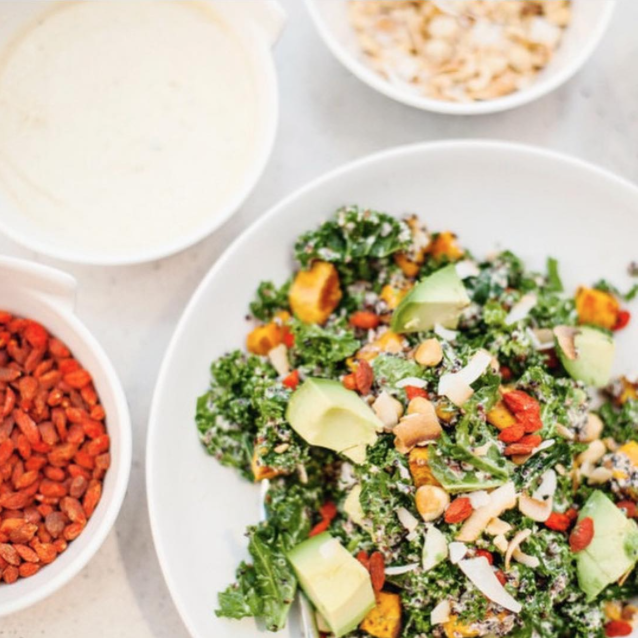 Combine kale with sweet potato, quinoa, avocado and hazelnut dressing. Top with toasted hazelnuts and coconut flakes and goji berries.